Testimonies in Art & Action: Igniting Pacifism in the Face of Total War has all the requisite ingredients of a thought-provoking exhibition rooted in the 1930s Spanish Civil War: dramatic art, powerful quotations, compelling historical documents. But perhaps the most intriguing aspect of the show, curated by J. Ashley Foster and the students from her "Peace Testimonies in Literature and Art" writing seminar, is its use of digital technology and a web-like "mind map" to show—literally—the connections among various elements of pacifism. The projects that make up the mind map delineate how literature and art created by the likes of Virginia Woolf, Pablo Picasso, Langston Hughes, and Muriel Rukeyser, as well as the peace testimonies of the Religious Society of Friends, can shape the conscience of a society and spread peace, explains Foster. A visiting assistant professor of writing and a fellow in the Writing Program, Foster created the course that culminated in the exhibition, which runs through Dec. 11 in Magill Library. "This kind of project," she says, "helps students to learn how to conduct real scholarly research." One student, for example, analyzed Picasso's sketches for the anti-war painting "Guernica" and traced the evolution of the image of a black-and-white bull from cartoonish to sinister. Through researching the different stages of the painting and citing other critics, the student argued that the bull represents Nationalist brutalities. Igniting Pacifism features the work of 48 freshmen from four sections of Foster's writing seminar. (Half took the course in spring 2015; the other half are enrolled in the current fall session.) "Students found images that correlated with the text, wrote the captions, documented research, and hyperlinked to someone else," Foster says. The digital analysis "makes the connections between texts and ideas real and concrete." In addition, six members of the Class of 2018—Christina Bowen, Adetomiwe Famodu, Ann-Victoria Isaac, Marcelo Jauregui-Volpe, Sophie McGlynn, and Ian Wheeler—worked on the display over the summer. In Magill's Sharpless Gallery, the walls are covered with supersized vinyl decals of weeping women, fallen soldiers, and other figures from "Guernica." They are juxtaposed with the poignant and powerful words of war correspondent Martha Gellhorn, and of Picasso, who wrote a prose poem titled "The Dream and Lie of Franco" to accompany a series of satirical etchings that were sold as postcards to raise money for Spanish refugees. 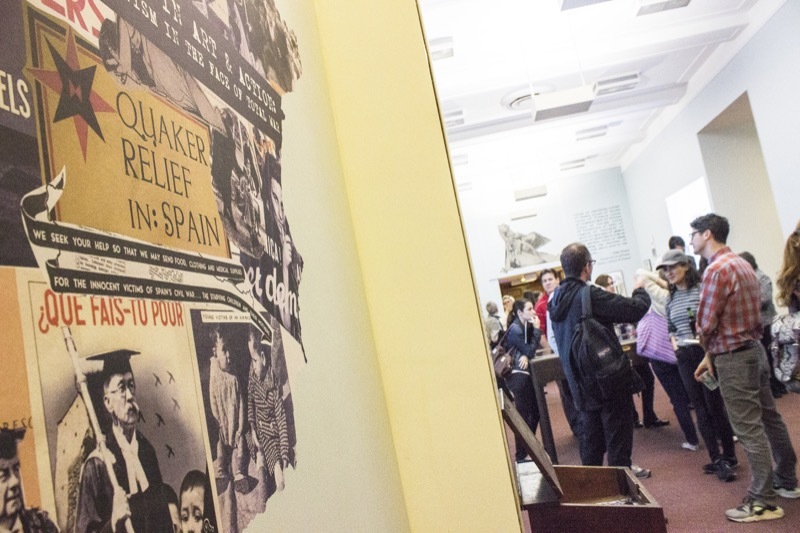 Pamphlets, diaries, letters, and posters from the College's own Quaker & Special Collections illustrate the pacifist call to promote peace and help refugees in Spain. On one wall of the gallery, visitors see a video projection of someone clicking through the mind map, which hyperlinks student-annotated literary texts, artistic images, and historical documents. These digital humanities projects consider literature, poetry, and painting, such as Woolf's polemic "Three Guineas," or Langston Hughes' poem "Addressed to Alabama," as pacifist works. A computer terminal allows visitors to interact with the online content. To demonstrate the historical arc of these issues and bring them into the present day, the exhibition also features a map of the contemporary refugee crisis, and wall placards offering information about the situation in Syria and other places, along with QR codes that visitors can scan with their cellphones to find out more. "War, and how to respond to it ethically, continues to represent an enormous challenge to the world today, as much as it did in the 1930s," says Librarian of the College Terry Snyder. "The exhibit challenges us to consider our own responses to our war-torn world, and in turn, it hopes to ignite our own ethical commitment to pacifism." Foster, who earned her Ph.D. in English in 2014 from the Graduate Center of the City University of New York, created her "Peace Testimonies" seminar out of the research from her doctoral thesis, Modernism's Impossible Witness: Peace Testimonies from the Modernist Wars. Raised in a Quaker family in New York that belonged to Scarsdale Friends Meeting, Foster says she started out as a scholar of war "because I didn't understand the causes of war." Then one day, as she was researching World War I at the Imperial Museum in London, she noticed a mother with four sons. "I'm sitting under these bomber planes eating my lunch. … The mother is saying to the boys, 'Which bomber plane would you like to fly?' … and I felt like I was looking at the next generation of soldiers," Foster says. "I decided I didn't want to focus primarily on war anymore. I wanted to expand the conversation to talk about peace, too." The narrative form—whether text or images—proved a powerful entry into pacifism and critical writing and research skills. "It is the 'invisible presences,' " Foster says, using Woolf's phrase, "that I love in art and literature, all the latent stuff. … A pacifist agenda is profoundly important to carry into and spread in the world today." Many of her students are likewise inspired. "Pacifism doesn't have to be passive," says Yardley, Pa., native Christina Bowen '18, one of the students who worked on the exhibition over the summer. "I really hope people who see this exhibit think about how they can apply pacifism in their own lives." Sophie McGlynn '18, of Canberra, Australia, another summer student worker, says she wanted to work on the project because she was "fascinated" by Haverford's Special Collections. She wrote the exhibition label for a British Quaker poster from 1938 that proclaims "World Justice Means World Peace" and tied its message to pacifist authors from the course material. "I hope the exhibit will ask questions that cannot be ignored—questions like 'Is peace inherently valuable?' or 'What is my responsibility as a human being in relation to other human beings when faced with violence?' " McGlynn says. "These are some of the questions I've been asking myself for many months." More on the exhibit's opening can be found on the Haverblog.